You can use AFerry to book a Scandlines ferry to Denmark, Germany and Sweden. Scandlines, a Danish company, is one of the leading operators in the Baltic area and Scandinavia. On board you will find a full range of facilities and the highest levels of service and comfort. AFerry always has cheap prices for Scandlines ferries and the latest special offers. You can use AFerry to book Scandlines ferries to Puttgarden on Fehmarn, Rodby on Lolland, Sassnitz on Rügen Island and more. For all Scandlines routes and for the latest cheap prices and sailing times see below. Click on your ferry route for a detailed Scandlines timetable with arrival and departure times. 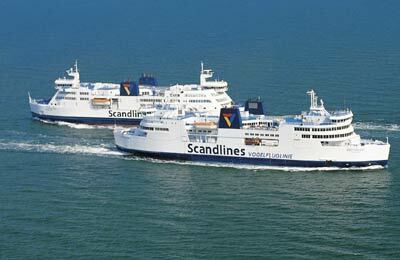 Scandlines has fleet of 14 ships making Scandlines the largest ferry company in the Southern part of the Baltic. In addition to comfortable cabins and seating, on board a Scandlines ferry you will be able to enjoy a wide range of bars and restaurants. For a quick meal or snack you can go to the self service restaurant or for fine Scandinavian and Baltic cuisine you can enjoy the full service a la carte restaurant. You will also find tax free shops on board where you can pick up a bargain or two. Note, however, that some ferries on very short routes may not offer all of these facilities. 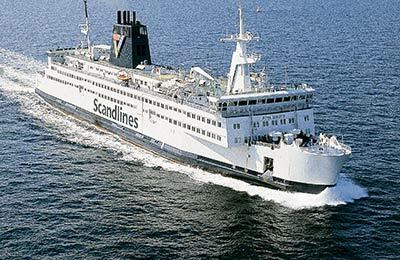 Whether you use the Scandlines Gedser Rostock ferry, the Scandlines Helsingborg Helsingor route, the Scandlines Puttgarden Rodby line or any other route with the Southern Baltic's largest ferry company, you are bound to have a pleasant and relaxing journey. Book your Scandlines ferry easily and securely with AFerry. How long before departure should I arrive for Scandlines? Quick relax and warmly welcome from staffs. Good service overall. Great app, easy to use and Scan Lines are a great company to sail with. Ferry fine but beware of border shop !!! Lets you go round and then refuses to sell you anything at the checkout unless you are Scandinavian.